I’ll be the first to admit that I am not a runner. I never have been the kind of person who found joy in running long distances (or short distances… or anywhere). But within the last year, I have had the enjoyment of being a part of three different races – and that’s really thanks to my good friends Kate, Heather, and Ashley. The four of us used to work together, though Ashley took a job in April at a local community college and is no longer at our office. Prior to that, though, we all decided it might be a fun adventure to run a race together. Kate and Heather are more athletic than Ashley and I are, so they chose to do a Distance Dare – they’d run a 10k race and then also run the 2-miler. Ashley and I stuck to the latter option (happily, might I add). It was a blast – the weather was perfect, and we ran around a quaint little section of town early in the morning. We then got a chance to cheer on Kate and Heather as they crossed the finish line. It was a fun event to participate in together, really. When I got a full-time job, I wanted to find people who I could be friends with at the office. I have been utterly blessed to hang out with these amazing ladies and get to know them. It’s something a lot of people don’t find in a job or career – people they actually WANT to see outside of work. And to be quite frank, I don’t think my boss and some of the other employees understand that concept… that we LIKE each other and are genuinely friends, not just colleagues. Our second race together was more recent one at UCF (both my and Kate’s alma mater). Once again, Kate and Heather chose to do a Distance Dare – to run a 5-mile race and then join Ashley and me afterward for the 2-miler. I made it my goal, then, to see exactly how fast I could run two miles. The morning was beginning to get rather hot and Florida isn’t the most ideal place to run when that occurs, but I gave it my best effort. As it turns out, I discovered that I could run the aforementioned distance in twenty minutes – a time I could never run on the treadmill, which surprised and delighted me! (You know… after I stopped panting at the finish line and didn’t feel like I was going to pass out.) The race was fun and I got a chance to walk back to my car with Ashley, which allowed us plenty of time to talk about work and life. And really, that is the beauty of things like races – events we get the opportunity to bond, to grow closer together, and to just be healthy about it. And then, there was Sunday’s race, marking our third adventure together: The Color Run 5k. If you’ve never heard of The Color Run before, you’re not alone. I’m not exactly sure where Ashley learned about the race, but she was the one to alert the rest of us that it was coming to Orlando. And really, this 5k is unlike most anything else. And that, precisely, is the reason we signed up for it. When we checked out the website and realized that this race was one in which you would get a different colored powder thrown onto you every kilometer… well, THAT sounded like a blast. So we signed ourselves up as a team – Team Beige Maze, a nickname we give to the office three-fourths of us still work at – and began to get excited for the race. Sadly, three out of the four of us were sick the week before and hadn’t quite gotten back into the swing of exercising. We vowed to lightly jog if necessary but to primarily walk the race. It would be, after all, the best way to get the most color thrown onto us. 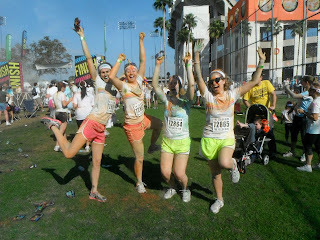 So we donned our white t-shirts, met up at Heather’s condo, and drove to downtown Orlando where the race was held. Thousands of other runners and walkers joined us – literally, people were there in droves. We parked and managed to find the start line without much difficulty (just follow the mass of people! ), and then stood in a wave of people for what seemed like hours. We hadn’t noticed it, but slowly and surely, people began to leave their places behind us and squeeze themselves closer to the starting line. Because there were so many runners, we were released in waves rather than all at once. We had been close to the middle of the pack when we arrived… and ended up in the last wave of runners, leaving the start line at 9:50 (almost an hour after the race officially “started”). But since this wasn’t a timed event, we didn’t care much – we just wanted to get as much color on our white race shirts as possible! And color ourselves we did. The first kilometer, we jogged and approached the pink zone, curious to know exactly how the whole throw-color-on-runners thing worked. We were greeted by a cloud of pink smoke as we ran through an archway. As it turned out, volunteers showered us from squirt bottles with the pink powder (no worries for those who want to run – it’s a mixture of corn starch and food dye, so it’s nothing toxic). By the time we reached the end of the pink zone, we were a bit more colorful than when we started. Heather lamented the fact that she barely had any of the pink powder on her – pink is her favorite color – but we had to move on. From then on out, we (as well as the vast majority of those around us) walked the 5k, and soon approached the second color zone: yellow. We had a bit more fun here, dancing through the color and pausing beside those who had squirt bottles full of the powder to get as covered as we possibly could. You can see from our photographs that slowly but surely we were beginning to grow more colorful. As we approached the third kilometer of the race, we entered the blue territory. Ah, what can I say about the blue zone? This was probably my favorite color zone in the run, and also the most DIFFICULT to get out of my hair and skin afterward. As we walked through the zone, we noticed a volunteer along the side scooping up an inch of blue powder that had fallen. Kate, Heather, and I approached and… she threw the shovelful of powder onto our heads. As you can see from the photos, Heather and I got quite colorful. Ashley was ahead of us (lost in a cloud of blue smoke… really, the powder is so thick in the color zones that it looks like a smoke bomb went off), but doubled back around to get more color thrown on her. We then headed – looking quite like Smurfs – to the final color zone before the finish line: orange. Now… orange was okay. Actually, for me it was the worst color zone. It was one of the best to physically show up on your clothes and skin, but here’s why I don’t have very fond memories of it: Heather, Kate, Ashley, and I paused in the orange zone to soak up as much color as we could, as it was the last zone before the color festival (where we would get to open our individual packets of color and go nuts). Ashley made orange powdered snow angels and Kate photographed. Heather was standing near a volunteer to get more color. And I turned to her to open my mouth and say something… which was unfortunate, because a volunteer chose that moment to throw color at me. A LOT of color went into my mouth. And it’s non-toxic, but let me tell you from experience: it doesn’t taste good! The poor volunteer kept repeatedly apologizing, and it wasn’t really her fault for not being able to predict that I would have my mouth open as she threw colored powder. Nevertheless, I tried to get the taste of corn starch out of my mouth by the time I reached the finish line. THAT was a spectacle to see! There were, as I said before, thousands upon thousands of people who participated in The Color Run. And, as I also said, when you received your race packet there was a little package of colored corn starch included. Every fifteen minutes, there would be an announcement for people to throw their color into the air, creating a giant sea of color. We didn’t want to wait that long, so we tore into those suckers and had a color fight amongst the four of us! Afterward, we took some glorious photos, like the one at the beginning of this post. That is a faux jumping photograph. The girl who took our photo asked if we wanted to do something fun (like a jumping photo), and Kate noted that her camera’s lens wouldn’t capture the shot in time. So the girl suggested that we fake jumping… and it was pretty awesome. We then took some fun after shots! Afterward, we headed back to Heather’s car and returned to her condo where her boyfriend, roommate Sam, and Sam’s girlfriend Christie were. Christie sat with us girls and watched the slideshow of photos from the morning while the guys made us all breakfast. And let me tell you, it was AWESOME breakfast: waffles, pancakes, toast, and “cheggs” (this is what Michael, Heather’s boyfriend, calls the type of scrambled eggs he makes – they’re basically smothered with cheese AND WERE THE BEST THINGS EVER). So we sat around, played with Heather’s dog, and refused to move from the couch until it was absolutely necessary to leave. Surprisingly, most of the color came off easily – except for that pesky blue. I had to wash my hair four times (and condition it almost as many) and scrub the blue powder off of me. And I’m sure that there is still some little bit of color on me SOMEWHERE on me, but it was more than worth it. Let me just tell you that if you ever get a chance to do The Color Run 5k (or Color Me Rad, or anything like this) DEFINITELY do it. You don’t have to be a runner. You don’t even have to be a walker – we saw lots of parents pulling their kids along in strollers and wagons.